Focus in the Middle School is on introducing new mathematics concepts and on developing greater degrees of instant response to basic arithmetic calculations. Students work more independently and learn more theory behind formulas and calculations. In addition to reviewing and increasing proficiency in all previous mathematics, the following new mathematical concepts are introduced at this level: division of fractions, ratios and proportions, probability and statistics, scientific notation and simple geometric calculations. The students’ proficiency at instant response computational skills is developed and improved through Math Facts on the Computer (MFC), a self-run, computerized program designed to achieve ever-increasing levels of instant response. Emphasis is on maintaining a high level of response on the four arithmetic operations through 12s and conversions of fractions, percents and decimals. There are over 100 computers throughout the school for students to use. In addition, our computer lab provides students with a wide array of technology resources for use on various activities and projects. All students learn basic computer usage, but additional classes are available where students can learn such things as computer programming, web design, robotics and basic graphic design skills. Internet access is provided through the school’s high-speed T1 connection. Knowing how to research effectively—to pose theories, make clear observations and draw accurate conclusions—is addressed at this level. Science curriculum in the Middle School includes courses covering elementary Chemistry, Anatomy and Physiology, Microscopes and Microbes and Electricity—which means students spend a good deal of time in the school’s well-equipped Science Lab. In addition to courses, students choose three other areas of interest from subjects ranging from a study of simple electromagnetic devices, to solar energy and its applications, to learning how to dissect. 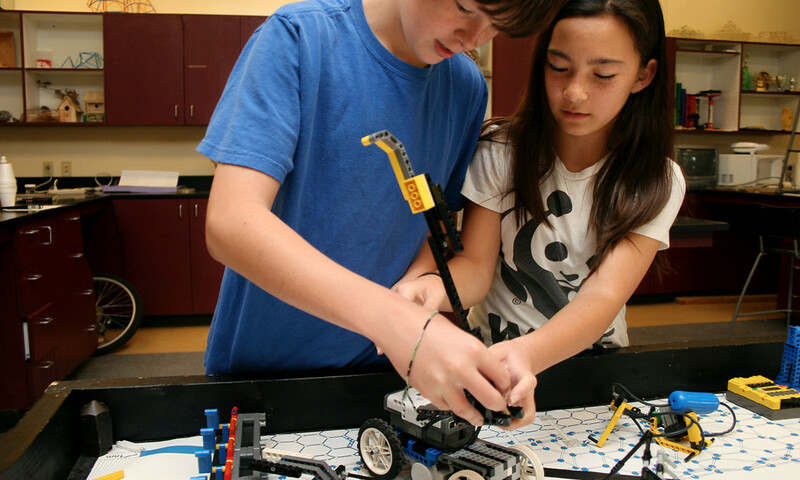 Middle School students may choose to participate in the school’s annual Science Fair. Projects focus on investigative tools, the students’ own understanding of the scientific phenomena represented and the students’ initiative and responsibility demonstrated. Understanding the larger environment provides students with an important perspective on their academic studies and depends on the integration of the humanities, sciences and social sciences. Emphasis in the Middle School is on comprehending people, places and events in a greater global context. Students become thoroughly familiar with U.S. geography. In addition to studying history from the Ancient Egyptians to modern times, students will learn how individuals have influenced history throughout the ages. Two courses, entitledPeople and Ideas and Conflicts and Ideas, explore the patterns and motivations behind historical events. Current Events Seminars are begun at this level, in which students participate in research and discussion on various current topics.